Matthew 5:14-19 - Ye are the salt of the earth. A city that is set on a hill cannot be hid. Neither do men light a lamp, and put it under a bushel, but on a lamp stand; and it giveth light unto all that are in the house. Let your light so shine before men, that they may see your good works, and glorify your Father Who is in heaven. Think not that I am come to abolish the law, or the prophets: I am not come to abolish, but to fulfill. For amen, I say unto you. Till heaven and earth pass away, one jot or one tittle shall in no wise pass from the law, till all be accomplished. Whosoever therefore shall disregard one of these least commandments, and shall teach men so, he shall be called least in the kingdom of heaven. But whosoever shall do and teach them, the same shall be called great in the kingdom of heaven. 14. Ye are the light of the world. First He calls them salt and then light. He who reproves what is done in secret is light, "for whatsoever doth make manifest is light" (Eph. 5:13) The apostles did not enlighten one nation only, but the world. He teaches them to struggle and to be strict in living a virtuous life, for they will be in view of all. Do not imagine, He says, that you will be hidden away in some corner, for you will be most visible. See to it, then, that you live blamelessly, lest you become a stumbling block for others. 15. Neither do men light a lamp, and put it under a bushel, but on a lamp stand; and it giveth light unto all that are in the house. 16. Let your light so shine before men, that they may see your good works, and glorify your Father Who is in heaven. He did not say, "You must display your virtue," for that is not good; but rather He said only, "Let it shine," so that even your enemies will marvel and glorify not you, but your Father. If we practice virtue, we must practice it for the glory of God, and not for our own glory. 17. Think not that I am come to abolish the law, or the prophets: I am not come to abolish, but to fulfill. He was about to introduce new laws, yet He did not want them to think that He was opposed to God. Therefore He says, anticipating the suspicion that many would have, "I have not come to abolish the law, but rather to fulfill it." How did He fulfill it? 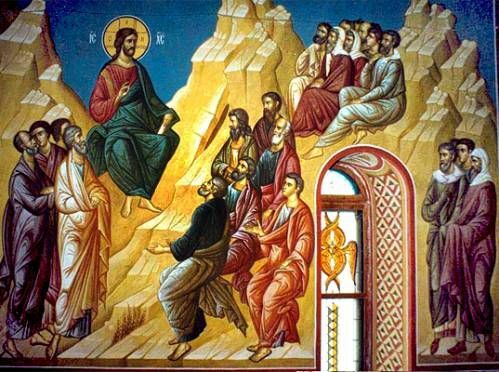 First, He did everything which the prophets had foretold concerning Him, which is why the evangelist often says, "So that what was spoken by the prophet might be fulfilled." He also fulfilled every commandment of the law. "For He did no sin, neither was any guile found in His mouth" (1 Peter 2:22). And He fulfilled and completed the law in yet another way: whatever the law had sketched in outline, Christ fully painted in. The law said, "Do not murder’’; but Christ said, "Neither be angry without a cause." So too the painter does not destroy the sketch, but rather completes it. 18. For amen, I say unto you. The "amen" is an assurance, meaning, "Yes, truly I say unto you." Till heaven and earth pass away, one jot or one tittle shall in no wise pass from the law, till all be accomplished. He indicates here that the world passes away and undergoes a change in form. He is saying, therefore, that while the universe subsists, not the least letter of the law will pass away. Some say that the "jot" [i.e. the Greek letter iota] and the "tittle" [i.e. accent mark] signify the ten commandments of the law; others say that they indicate the Cross, for the iota is the upright beam of the Cross, and the accent, the transverse beam. Christ is saying, therefore, that everything that was spoken concerning the Cross will be fulfilled. 19. Whosoever therefore shall disregard one of these least commandments, and shall teach men so, he shall be called least in the kingdom of heaven. The "least commandments" are those which He Himself is about to give, not those of the law of Moses. He calls them "least" out of humility, to instruct you, O reader, to have moderate thoughts of yourself as you give your teachings. He who "shall be called least in the kingdom of heaven" means he who will be last in the resurrection and who will be cast into gehenna. For such a one shall not enter the kingdom of heaven, far from it! By "kingdom" understand the resurrection. But whosoever shall do and teach them, the same shall be called great in the kingdom of heaven. First Christ says, "whosoever shall do," and then, "and shall teach"; for how can I guide another along a road that I have not myself travelled? By the same token, if I practice the commandments, but do not teach them, my reward is not so great. There can even be condemnation, if I do not teach because of spite or sloth.